Expo Veneto: Let’s discover the Po delta: an experience you must try. Event > Let’s discover the Po delta: an experience you must try. LET’S DISCOVER THE PO DELTA: AN EXPERIENCE YOU MUST TRY. A unique experience, an unforgettable weekend to get in contact with uncontaminated nature; two days to relax and find yourself among nature. We offer a two days trip. - In the afternoon we will deliver your bikes and let’s start the adventure! We will ride for about 12 km, biking around the “Sacca di Scarovari”, admiring the natural landscape and the cultivation of mussels. - Arrive at the Locanda and dinner. - We will start the day with an amazing boat ride, discovering unexplored territories. Here we will admire many different birds. - Coming back to the Locanda we can visit the Ca' Vendramin Regional Land Reclamation Museum, where we can enjoy a special visit to an imposing Water Pump and many historic tools. Every day we offer a boat-ride with local fishermen: they will tell you the history of the area and they will explain you the ecosystem of the Natural Park. The trip lasts about three hours. Located in the natural reserve of Po delta, our hotel and restaurant “Locanda Degli Antichi Sospiri” offers to its customers all necessary comfort to feel like at home. It is equipped with five rooms all with private bathroom. The restaurant is on the ground floor; in summer the clients can enjoy a meal in the beautiful garden, being in harmony with flowers and plants, that embrace the structure. 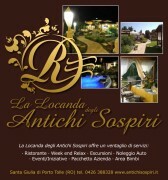 In the middle of little Town of Santa Giulia di Porto Tolle is set the Locanda degli Antichi Sospiri ( inn of the ancient sighs). The inn name comes from the resort mane, in ancient time called polesinello dei sospiri ( polesinello of sighs), maybe an echo of famous Venice bridge or, more realistic, referred to daily exertion of its inhabitants. The inn is a little Hotel with restaurant, recently renovated, it’s managed by Mrs. Fabrizia and her sons, witch are friendly and kind with their guests. The managers welcome them spontaneously and with great attention in reserving them. The restaurant is on the ground floor, it’s a large and tasteful room, air conditioned, with 70 seats. There you can find typical traditional dishes and peculiar fish course. We suggest bass carpaccio soused whit citrus, catalana lobster, shrimps, ecc, small octopuses whit polenta, and traditional mixed grilled Atlantic fish with delicious roasted eel. You can choose a good wine and a homemade dessert. I also enclose photos of restaurant, of our bedrooms with bathroom, fridge, air conditioned and TV, of renovated garden that will be inaugurate on Easter Sunday.